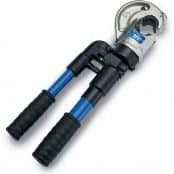 Cembre HT131-C hydraulic cable crimping tool is a manual tool for the crimping of low and high voltage cable lugs, splices and connectors up to 400sqmm. Cembre HT131-C crimping tool is lightweight and ideal for use on overhead lines and other LV-HV cable jointing, splicing and terminating applications. The hydraulic crimping tool features spring loaded handles allowing the Cembre die sets to be advanced with one hand – the other hand free to position the electrical connector prior to crimping. 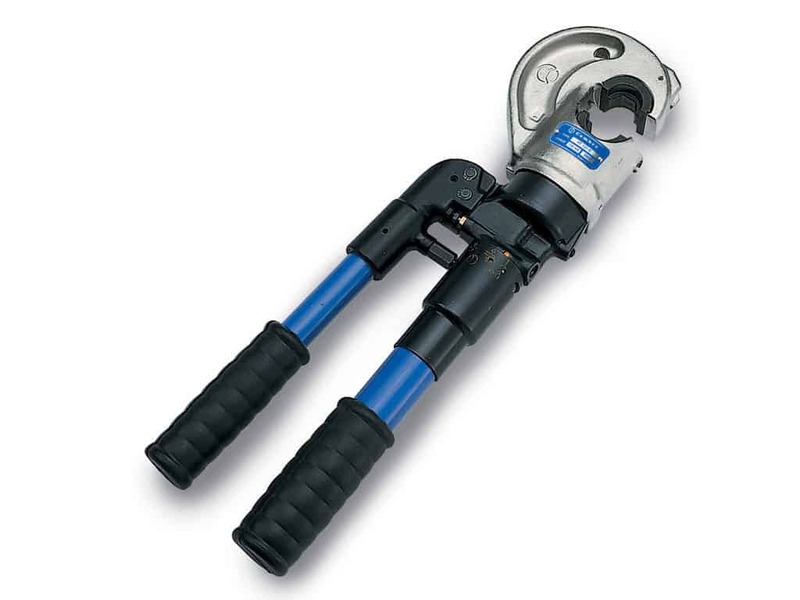 In addition, the crimp tool head is fully rotatable through 180 degrees for ease of use and comfort for the user enabling crimping in confined or restricted areas including LV-HV switchgear, substations and electrical panels. The built in safety valve also by-pass the oil supply when maximum pressure has been reached – a pressure releasing system being easily operated at any stage of the compression process. Cembre HT131-C hydraulic crimping tool is modified to accept die sets to perform “Deep Stepped Indent” system of crimping on aluminium cables. 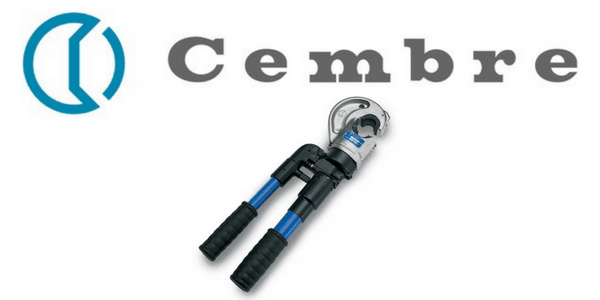 Cembre HT131-C tool is suitable for compression of electrical connectors on conductors up to 400sqmm (800 MCM) and has three operating positions identified on the main handle. The two-speed ram advance of the HT131-C allows for easy positioning of the connector, prior to the crimping process. 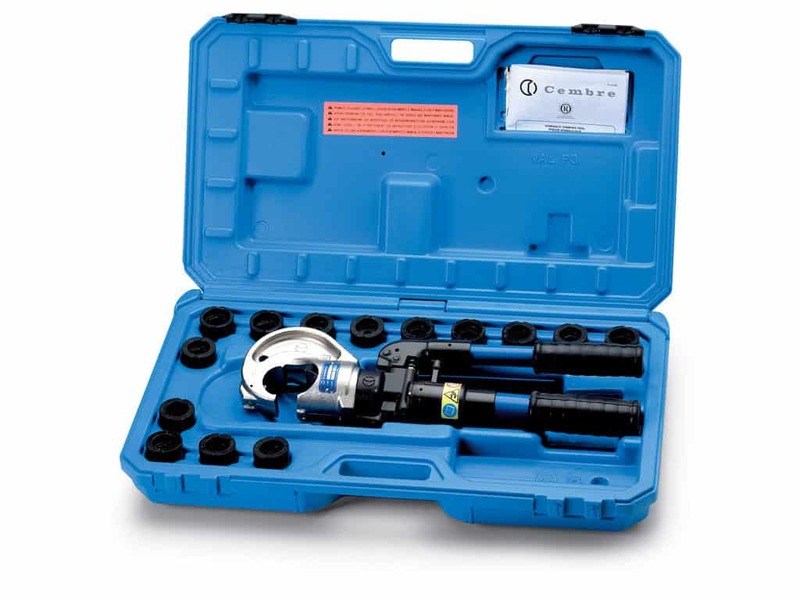 For storage and protection the Cembre HT131-C tool is supplied in a robust carrying case for storage of the crimping tool and up to 14 sets of die sets. Select the appropriate die set for the connector. Insert the die in the upper seat of the tool head until it is locked by die/head pin. To ease the die insertion, keep die/head release pin depressed. Insert the die in the seat on the head of main ram until it is locked by die/ram retainer pin. To ease this operation, keep die/ram release pin depressed. Insert the conductor in the connector. Position the connector between the dies and ensure the correct location of the crimp. Set the HT131-C tool on release position by rotating main hanle; open the moveable handle. Rotate main handle to operating position . Operate moveable handle for lower die advancement. This first stage rapidly closes the dies to the connector. Never place the tool under pressure without inserting the dies, as this could cause damage to the head and the ram. Make sure the dies are exactly positioned on desired crimp point, otherwise re-open dies and position the connector again. Continue operating the moveable handle. The tool will automatically change over to the high pressure stage. The ram will advance until the dies meet. It is recommended to continue pumping until the maximum pressure valve is activated and a “click” is heard. Rotate the main handle to release position . Close handles thoroughly: the ram will then retract, with the consequent opening of the dies. Keeping handles closed rotate further the main handle to rest position ; the moveable handle will be thus locked. Store the tool in the case. 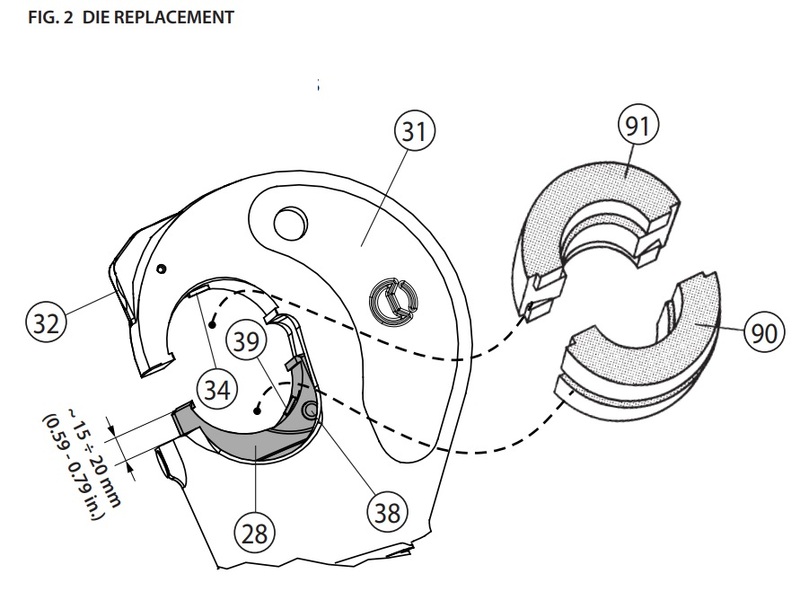 Insert replacement die until secured by the die retaining pin (34). Take the die off its guide by pushing the die/ram release pin (38). To facilitate this operation an advancement of 15÷20mm of the ram (28) is suggested. Insert the new die in its guide till die/ram retainer pin (39) will hold it properly. 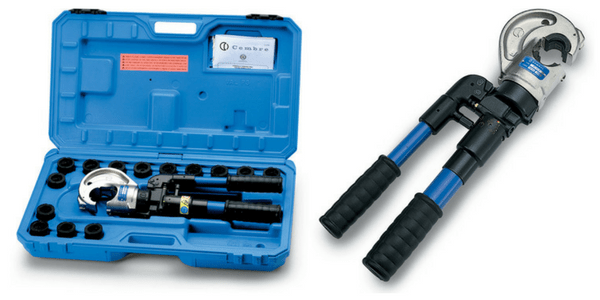 Cembre HT131-C hydraulic crimping tool is generally used to terminate conductors during the installation of LV cable glands (up to 400sqmm) or MV HV joints and terminations (up to 400sqmm) – this includes both Cold Shrink and heat shrink types. 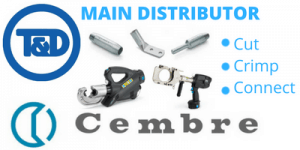 Cembre provides a matched crimping system to ensure secure LV MV HV electrical connections (lugs and splices) manufactured from copper or aluminium in accordance with CE Marking and international standards – includes a full range of nest, indentor and die sets compatible with their hydraulic and battery crimping tools, all manufactured by Cembre. 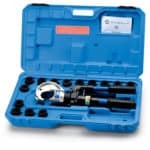 A complete range of die sets are available for installing and crimping all types of Cembre lugs and connectors when using the HT131-C crimping tool. For crimping applications including high voltage copper connectors and high voltage cable lugs including IEC228/BS6360 conductors please contact T&D.